A resurgence of an industrial interior trend this year has prompted many designers to focus on steel structures and Steel frames, to add a tough elegance to spaces around the world. Since Steel windows were first invented during the 1880s, the versatile and streamlined windows have been integrated into a number of pinnacle interior design trends through the decades, particularly during the Art Deco era. The steel frames, which could be customised to fit into angles and different spaces, allowed architects and designers new freedoms which inspired both geometric lines and ornate curves to take shape. In 2015, designers and furniture stores, such as Heals, have focused on collections which have amalgamated comfort with industrial details. Adorning a space with contemporary, industrial features which are both strong and elegant, like a simple steel window, has been a firm trend this year. 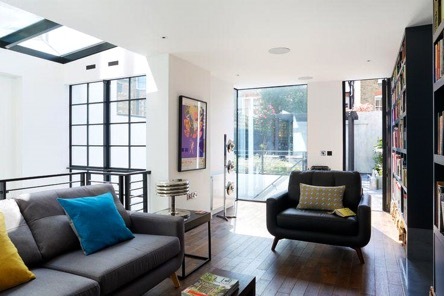 High-end London homes and commercial buildings have installed minimal framed metal windows to maximise natural daylight and sit alongside plush furniture and traditional property features. Industrial lighting, which utilises black and stainless steel, has also emerged as a kitchen decor trend in 2015, which lends itself well to a steel-framed window in the homes focal room. An emerging industrial trend was recognised in 2014 too, at the High Point Market and within a seminal line for the American home furnishings company, Restoration Hardware. From the design era, which still influences all design industries today, to utilitarian design which was heavily adopted by architects in New York during the 1970’s, steel -framed products have been a staple in properties across the world. The eco-friendly, highly recyclable properties of steel now make it a popular global building material and is North America’s most recycled material. The popular industrial trend is not only famed for its aesthetic value, it has also provided an affordable option for commercial and residential developers. As steel is so hard-wearing and durable, steel-framed windows can be enjoyed for at least 15 years and offers a superior coating on hot dip galvanising which is the robust and well tested polyester powder paint. Clement is familiar with the simplicity and beauty of a steel frame, and it seems that an increasing customer base is now informed too. After decades of refinement and updated surface finishes, steel-framed windows have never looked so good. The diverse Clement range are made to the highest quality in our own ISO 9001 approved factory and offers some of the slimmest sight lines on the market. All of our windows and doors are handmade to meet certain requirements and we handle each project from an initial enquiry to the completed fitting.